How much can you learn in half a minute? With this cool series, the answer is – LOTS! It’s full of smart knowledge in a super-speedy format that leaves you full of wonder, but doesn’t gobble up your precious time. 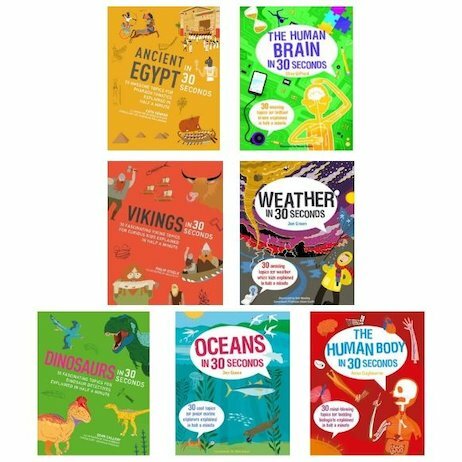 It’s got all the topics you most want to know about: oceans, Vikings, dinosaurs, the human body. But you needn’t read the books in one go. That’s not what they’re designed for. Instead, each colourful spread covers a must-know topic in a 30-second soundbite and a snappy three-second flash summary. Still got time on your hands? Great! Try the three-minute activity mission, just for fun.